N. Karmitsa, A. Bagirov, S. Taheri, "Clustering in large data sets with the limited memory bundle method" (author version), Pattern Recognition, Vol. 83, pp. 245-259, 2018. The publication is available online at www.sciencedirect.com (free access before August 07, 2018). K. Joki, A. Bagirov, N. Karmitsa, M.M. Mäkelä, S. Taheri, "Double bundle method for finding Clarke stationary points in nonsmooth DC programming" (author version), SIAM Journal on Optimization, SIAM Journal on Optimization, 28(2), 1892-1919, 2018. N. Karmitsa, M. Gaudioso, K. Joki, "Diagonal Bundle Method with Convex and Concave Updates for Large-Scale Nonconvex and Nonsmooth Optimization" (author version), Optimization Methods and Software, to appear 2017. DOI 10.1080/10556788.2017.1389941. The publication is available online at http://www.tandfonline.com. O. Montonen, N. Karmitsa, M.M. Mäkelä, "Multiple subgradient descent bundle method for convex nonsmooth multiobjective optimization" (free copy for 50 first), Optimization: A Journal of Mathematical Programming and Operations Research, Vol. 67, No. 1, pp. 139-158, 2018. N. Karmitsa, A. Bagirov, S. Taheri, "New diagonal bundle method for clustering problems in large data sets" (author version), European Journal of Operational Research, Vol. 263, No. 2, pp. 367-379, 2017. DOI: 10.1016/j.ejor.2017.06.010. The publication is available online at www.sciencedirect.com. V.-P. Eronen, J. Kronqvist, T. Westerlund, M.M. Mäkelä, N. Karmitsa, "Method for solving generalized convex nonsmooth mixed-integer nonlinear programming problems" (author version), Journal of Global Optimization, Vol. 69, pp. 443-459, 2017. DOI: 10.1007/s10898-017-0528-7. A full-text view-only version of the paper is available by the Springer Nature. K. Joki, A. Bagirov, N. Karmitsa, M.M. Mäkelä, "A proximal bundle method for nonsmooth DC optimization utilizing nonconvex cutting planes" (author version), Journal of Global Optimization, Vol. 68, pp. 501–535, 2017. DOI: 10.1007/s10898-016-0488-3. A full-text view-only version of the paper is available by the Springer Nature. N. Karmitsa, "Testing Different Nonsmooth Formulations of the Lennard-Jones Potential in Atomic Clustering Problems" (author version), Journal of Optimization Theory and Applications, Vol. 171, No. 1, pp. 316-335, 2016. DOI 10.1007/s10957-016-0955-5. A full-text view-only version of the paper is available by the Springer Nature. N. Karmitsa, "Diagonal discrete gradient bundle method for derivative free nonsmooth optimization (free copy for 50 first). Optimization: A Journal of Mathematical Programming and Operations Research, Vol. 85, No. 8, pp. 1599-1614, 2016. DOI 10.1080/02331934.2016.1171865. The publication is available online at http://www.tandfonline.com. N. Karmitsa, "Diagonal Bundle Method for Nonsmooth Sparse Optimization" (author version), Journal of Optimization Theory and Applications, Vol. 166, No. 3, pp. 889-905, 2015. DOI 10.1007/s10957-014-0666-8. The definitive publication is available online at www.springerlink.com. S. Pulkkinen, M.M. Mäkelä, N. Karmitsa, "A Generative Model and a Generalized Trust Region Newton Method for Noise Reduction" (author version), Computational Optimization and Applications, Vol. 57, No. 1, pp. 129-165, 2014. DOI 10.1007/s10589-013-9581-4. The definitive publication is available online at www.springerlink.com. A. Bagirov, L. Jin, N. Karmitsa, A. Al Nuimat, N. Sultanova, "Subgradient method for nonconvex nonsmooth optimization", Journal of Optimization Theory and Applications, Vol. 157, No. 2, pp. 416-435, 2013. DOI 10.1007/s10957-012-0167-6. S. Pulkkinen, M.M. Mäkelä, N. Karmitsa, "Continuation Approach to Mode-Finding of Multivariate Gaussian Mixtures and Kernel Density Estimates", Journal of Global Optimization, Vol. 56, No. 2 pp. 459-487, 2013. DOI 10.1007/s10898-011-9833-8. N. Karmitsa, A. Bagirov, "Limited Memory Discrete Gradient Bundle Method for Nonsmooth Derivative Free Optimization" (author version), a free copy of the original article for 50 first can be downloaded here, Optimization: A Journal of Mathematical Programming and Operations Research, Vol. 61, No. 12, pp. 1491-1509, 2012. DOI 10.1080/02331934.2012.687736. The definitive publication is available online at http://journalsonline.tandf.co.uk. J. Steward, I.M. Navon, M. Zupanski, N. Karmitsa "Impact of Non-Smooth Observation Operators on Variational and Sequential Data Assimilation for a Limited-Area Shallow Water Equations Model", Quarterly Journal of the Royal Meteorological Society, Vol. 138, No. 663, pp. 323-339, January 2012, Part B, 2012. DOI 10.1002/qj.935. N. Karmitsa, A. Bagirov, M.M. 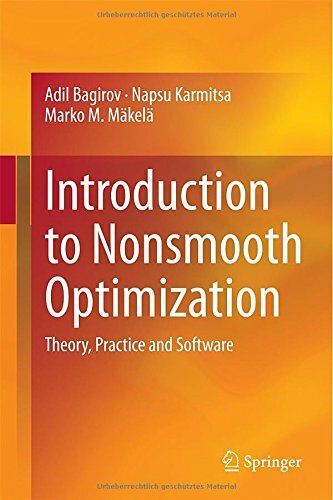 Mäkelä, "Comparing Different Nonsmooth Minimization Methods and Software" (author version), a free copy of the original article for 50 first can be downloaded here, Optimization Methods and Software, Vol. 27, No. 1, pp. 131-153, 2012. DOI 10.1080/10556788.2010.526116. The definitive publication is available online at http://informaworld.com. N. Karmitsa, M. Tanaka Filho, J. Herskovits, "Globally Convergent Cutting Plane Method for Nonconvex Nonsmooth Minimization" (author version), Journal of Optimization Theory and Applications Vol. 148, No. 3, pp. 528-549, March 2011. DOI 10.1007/s10957-010-9766-2. The original publication is available online at www.springerlink.com. N. Karmitsa, M.M. Mäkelä, "Limited Memory Bundle Method for Large Bound Constrained Nonsmooth Optimization: Convergence Analysis" (author version), a free copy of the original article for 50 first can be downloaded here, Optimization Methods and Software, Vol. 25, No. 6, pp. 895-916, 2010. DOI 10.1080/10556780902842495. The original publication is available online at http://informaworld.com. N. Karmitsa, M.M. Mäkelä, "Adaptive Limited Memory Bundle Method for Bound Constrained Large-Scale Nonsmooth Optimization" (author version), a free copy of the original article for 50 first can be downloaded here, Optimization: A Journal of Mathematical Programming and Operations Research, Vol. 59, No. 6, pp. 945-962, 2010. DOI 10.1080/02331930902884398. The original publication is available online at http://informaworld.com. N. Karmitsa, M.M. Mäkelä, M.M. Ali, "Limited Memory Interior Point Bundle Method for Large Inequality Constrained Nonsmooth Minimization" (author version), Applied Mathematics and Computation, Vol. 198, No. 1, pp. 382-400, 2008. DOI 10.1016/j.amc.2007.08.044. The original publication is available online at www.sciencedirect.com. N. Haarala, K. Miettinen, M.M. Mäkelä, "Globally Convergent Limited Memory Bundle Method for Large-Scale Nonsmooth Optimization" (author version), Mathematical Programming, Vol. 109, No. 1, pp. 181-205, 2007. DOI 10.1007/s10107-006-0728-2. The original publication is available online at www.springerlink.com. M. Haarala, K. Miettinen, M.M. Mäkelä, "New Limited Memory Bundle Method for Large-Scale Nonsmooth Optimization" (author version), Optimization Methods and Software, Vol. 19, No. 6, pp. 673-692, 2004. DOI 10.1080/10556780410001689225. The original publication is available online at http://journalsonline.tandf.co.uk. V.-P. Eronen, M.M. Mäkelä, N. Karmitsa, "On Generalized Pseudo- and Quasiconvexities for Nonsmooth Functions" in Current Research in Nonlinear Analysis: In Honor of Haim Brezis and Louis Nirenberg. Th.M. Rassias (eds. ), pp 129--155, Springer, 2018. N. Karmitsa, "Numerical Methods for Large-Scale Nonsmooth Optimization" in "Big Data Optimization: Recent Developments and Challenges". A. Emrouznejad (eds. ), Springer, Studies in Big Data, Vol. 18, 2016. M.M. Mäkelä, N. Karmitsa, O. Wilppu, "Proximal Bundle Method for Nonsmooth and Nonconvex Multiobjective Optimization" (author version) in Mathematical Modeling and Optimization of Complex Structures. T. Tuovinen, S. Repin and P. Neittaanmäki (eds. ), Vol. 40 of Computational Methods in Applied Sciences, pp. 191-204, Springer, 2016. M.M. Mäkelä, V.-P. Eronen, N. Karmitsa, "On Nonsmooth Multiobjective Optimality conditions with Generalized Convexities" in Optimization in Science and Engineering. Th.M. Rassias, C.A. Floudas, and S. Butenko (eds. ), pp. 341-366, Springer, 2014. M.M. Mäkelä, N. Karmitsa, A. Bagirov, "Subgradient and Bundle Methods for Nonsmooth Optimization" in Numerical Methods for Differential Equations, Optimization, and Technological Problems. Sergey Repin, Timo Tiihonen, and Tero Tuovinen (eds. ), pp. 275-304, Springer, 2013. K. Majava, N. Haarala, T. Kärkkäinen, "Solving Variational Image Denoising Problems Using Limited Memory Bundle Method", in Recent Progress in Scientific Computing. Proceedings of SCPDE05, Wenbin Liu, Michael Ng and Zhong-Ci Shi (eds. ), pp. 319-332, Science Press, Beijing, 2007. Note that prior to my marriage, I published under my maiden name of "Marjo Haarala". I have also taken my long term nick name "Napsu" to my first official name. Thus both "M. Haarala" and "N. Haarala" in the references are equal to "N. Karmitsa".